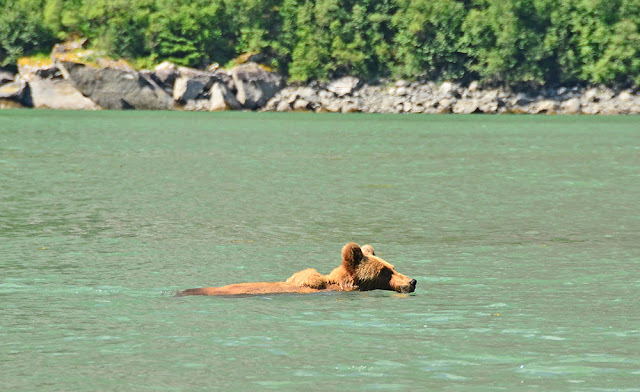 We had an easy trip into Juneau...calm water, sunshine, light traffic. The weather was much sunnier than expected. Given the excellent visibility, once we got cell phone service I called Alaska Seaplanes and chartered a DeHavilland Beaver for an afternoon scenic flight over Taku Glacier. The Beaver is an amazing airplane. 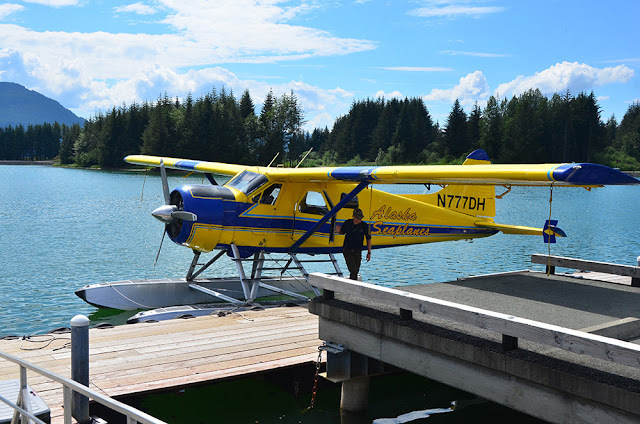 Despite being out of production since 1967, Beaver's continue to be the workhorse seaplane in this part of the world. They're renowned for their toughness, short field capability, and cargo hauling capacity. The plane we flew on was built in 1949 and continues to provide reliable service (not many original parts remain, of course). 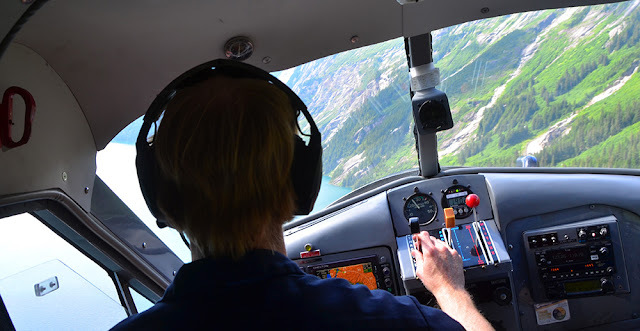 It's not the most refined airplane, and it's certainly not the fastest, but it's a favorite of pilots and operators alike. Departing Juneau. 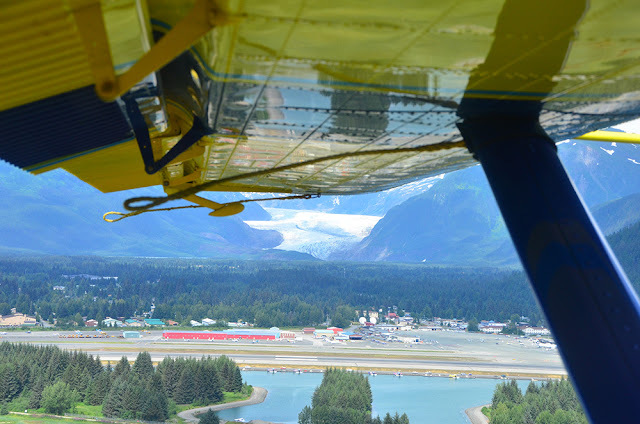 Mendenhall Glacier as seen from just above the Juneau Airport. 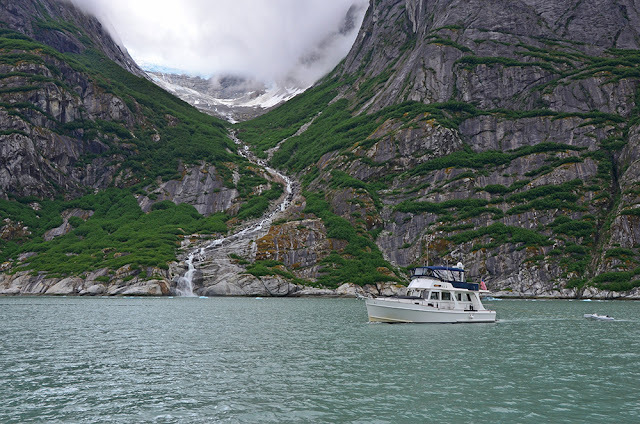 Our route took us south in Gastineau Channel and then north towards Norris Glacier. 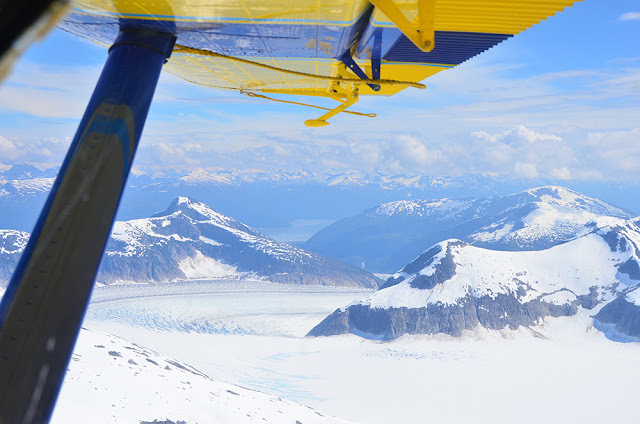 We circled Norris Glacier and Taku Glacier, then landed on Turner Lake before returning to Juneau. Seeing this area from the air was awesome. Mountains and glaciers. 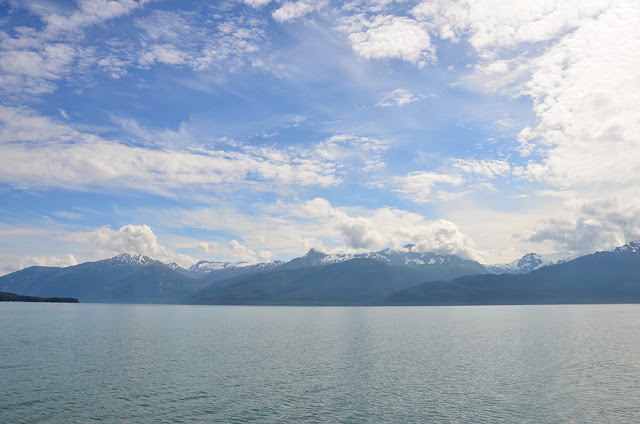 Taku Inlet in the distance. We flew for a little over an hour and covered 90 nautical miles. Totally worth the time and expense in order to see a whole different side of Southeast Alaska. Time to leave Ford's Terror. High water slack in Juneau was at 7:53 a.m., and we exited the rapids about 15 minutes after that. The current was running a couple knots against us. We left Ford's Terror at the right time. Two boats, including one small cruise ship, entered right after we exited. Mysteriously, my generator stopped working. The engine ran fine, but it wouldn't produce voltage. Once clear of the rapids, I dug into the problem. I tightened every electrical connection I could find, and the generator came back to life. It's frustrating not knowing the specific cause, but hopefully the generator will keep working! 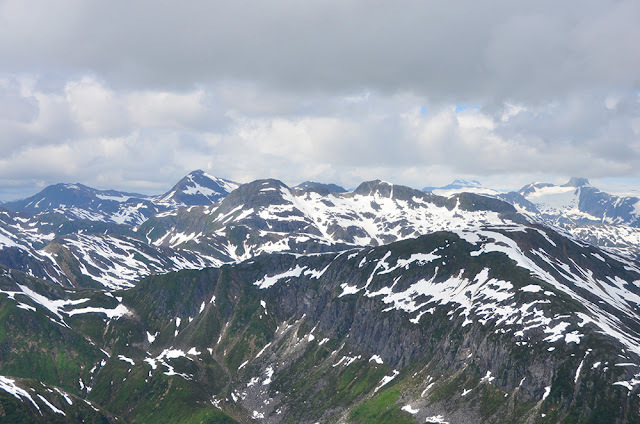 The trip up to Taku was uneventful. Calm water, no rain, even occasional sunshine. 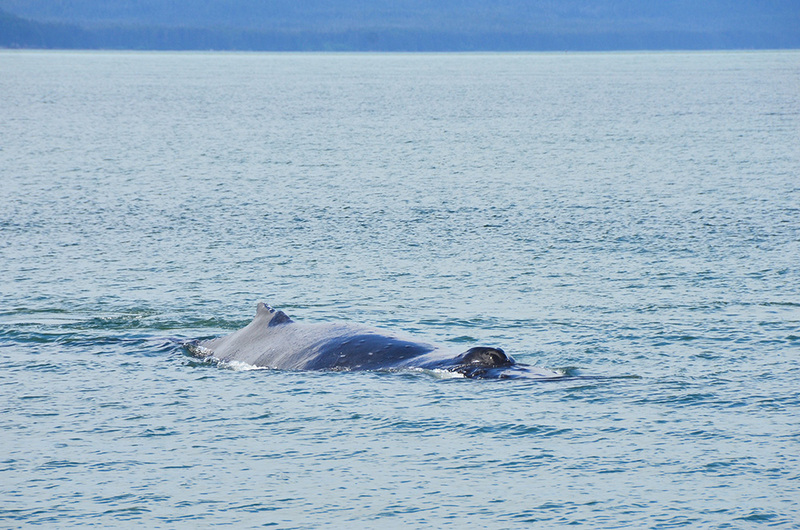 Commercial fishing has begun, though, so we did have to dodge a few gillnets. Can you find the gillnet? 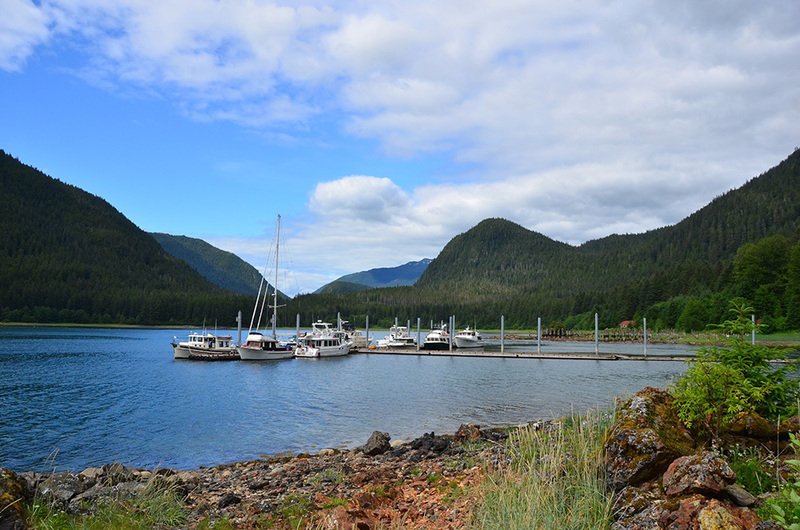 At Taku we wandered around the old cannery, swung on the ropeswing, and relaxed on the dock. We had happy hour on the dock with Kevin and Laura, then the bugs chased us all onto Safe Harbour for dinner. 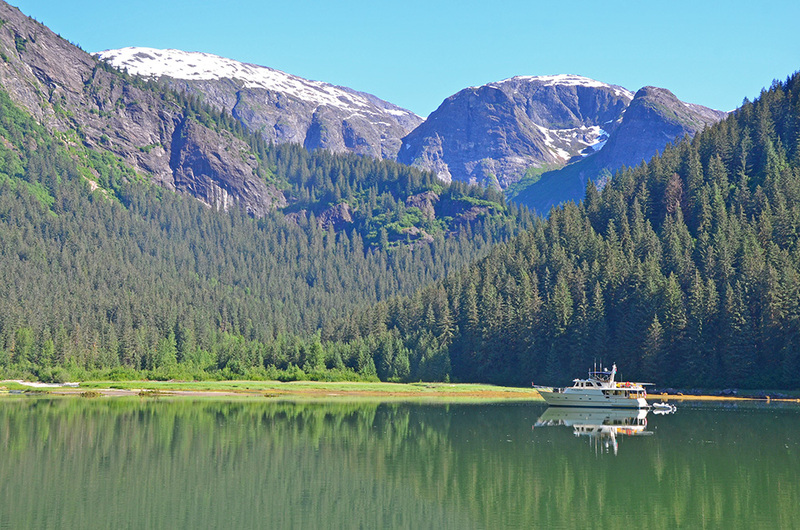 Tomorrow we're back to Juneau. Ford's Terror came through again. 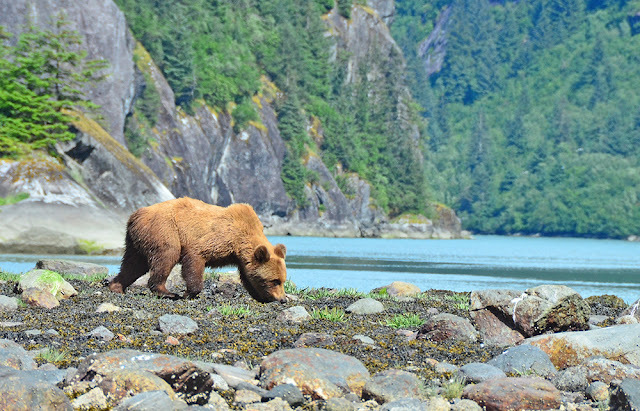 Sunny skies, warm temperatures, bears on shore, breathtaking scenery. Yep, it's my favorite anchorage. Safe Harbour and Airship anchored in the west arm of Ford's Terror. The west arm of Ford's Terror shoals rapidly. My boat is the one further out and I'm anchored in about 130 feet of water. Anchoring in less than about 70 feet of water puts you perilously close to the mudflat. 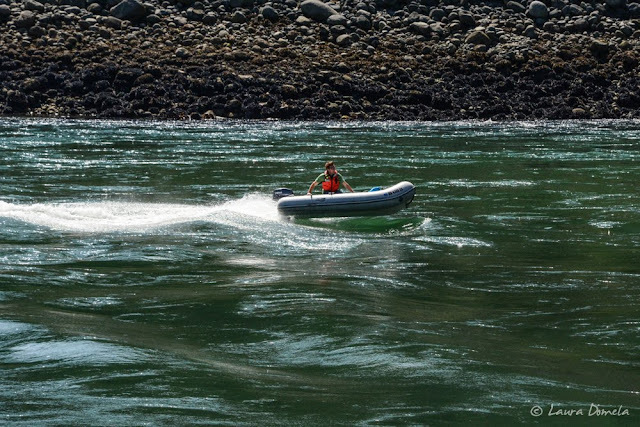 I spent a bunch of time exploring the rapids in the dinghy. My first trip to the rapids was about mid-way through the ebb. The current was running about 6 knots, but the water wasn't that turbulent. 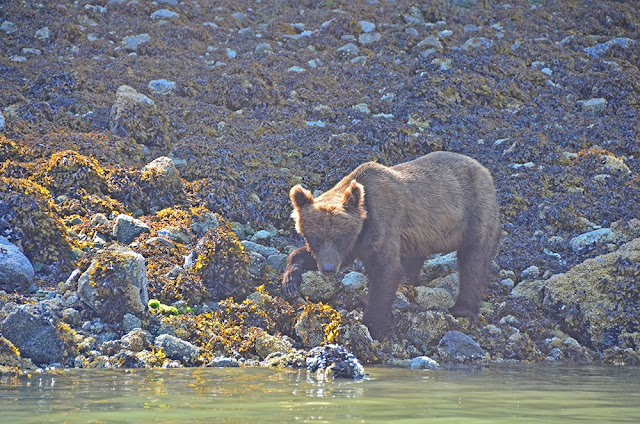 Kevin, Laura, and I went back close to low water in Juneau and found a whole different beast. The ebb was roaring through the rapids, creating a nasty set of standing waves. Running at a slow plane in the dinghy, I was making no progress against the current. I'd estimate the velocity at 10 knots. 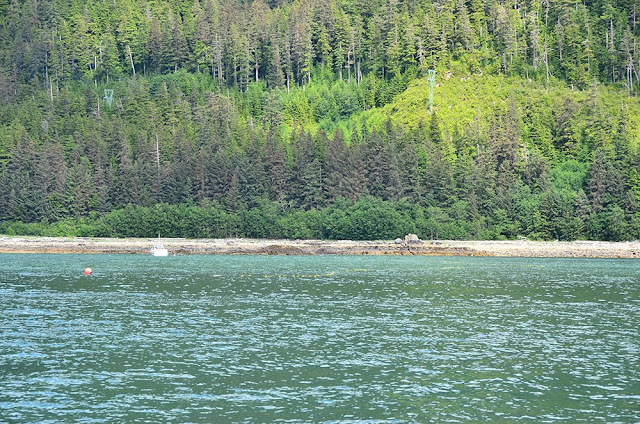 Low water in Juneau (a 1.2 foot tide) was at 12:55 p.m. Slack at Ford's Terror didn't happen until 2:32 p.m. While we waited for the current to turn, I flew the drone and got some great aerials showing the shoals when approaching the rapids. 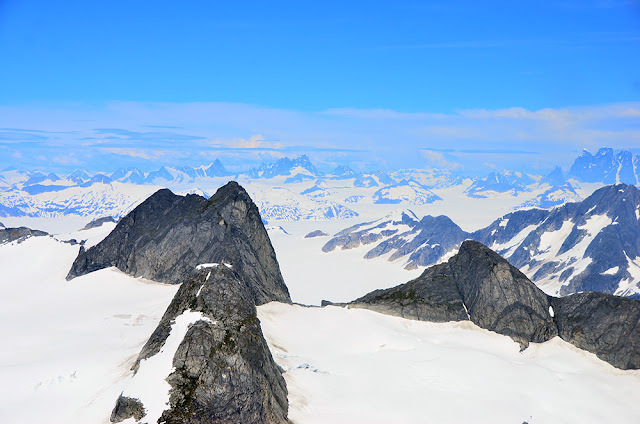 Paradoxically, we found the safest route through is to pass directly over the southern of the two charted rocks (this rock doesn't actually exist). A course from the waterfall to this charted rock to mid-channel in the rapids keeps you off all the shoals. None of the shoals are charted. Complete info on getting into Ford's Terror will be posted on my new website (www.slowboat.com) in the coming weeks. 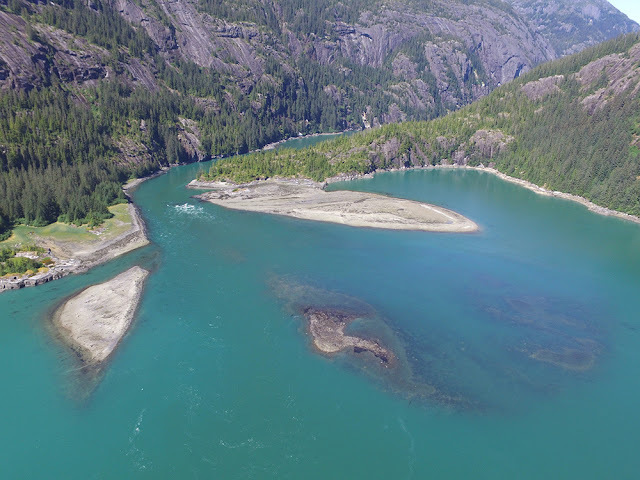 After I flew the drone and the rapids calmed down, I played in the dinghy. 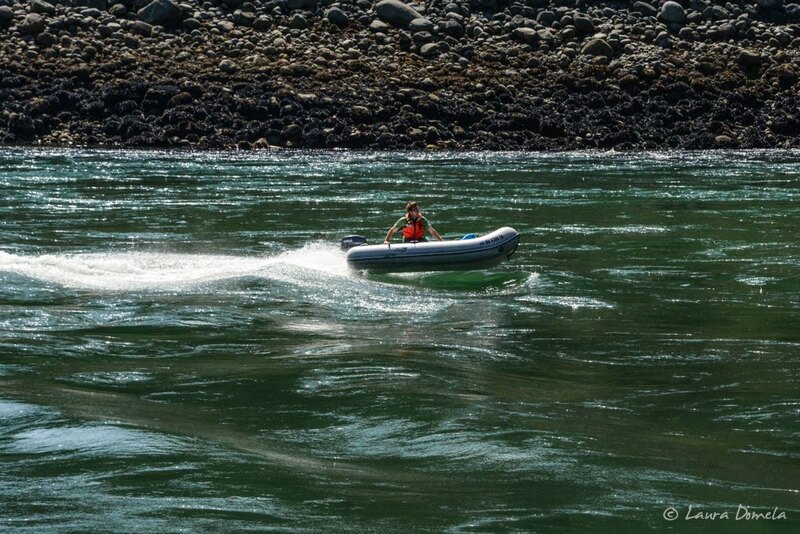 Laura got a bunch of pictures of me coming through the rapids. Slow boat, fast dinghy! When we got back the boats, a brown bear was foraging on shore. The light wasn't great, but we were able to get very close in the dinghy. 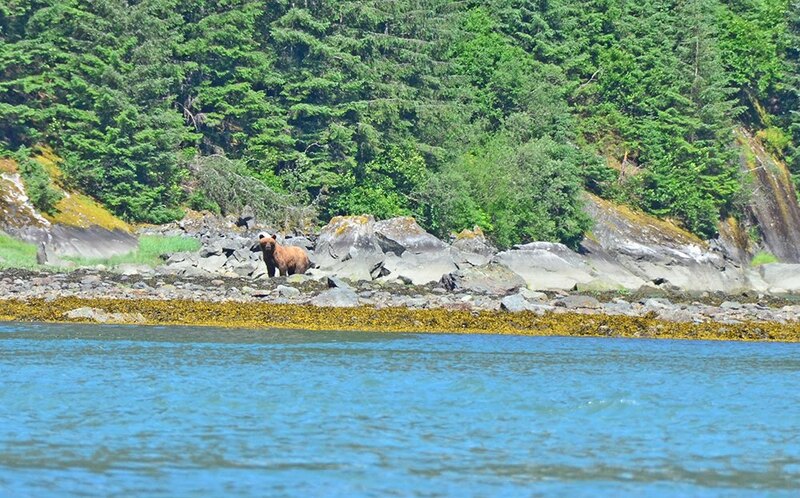 The bear looked up at us periodically and then continued flipping rocks over in search of mussels and clams. Watching the bear flip over rocks weighing several hundred pounds with almost no effort really puts their strength into perspective. Apparently the bear had taken a swim a little while before we got there. 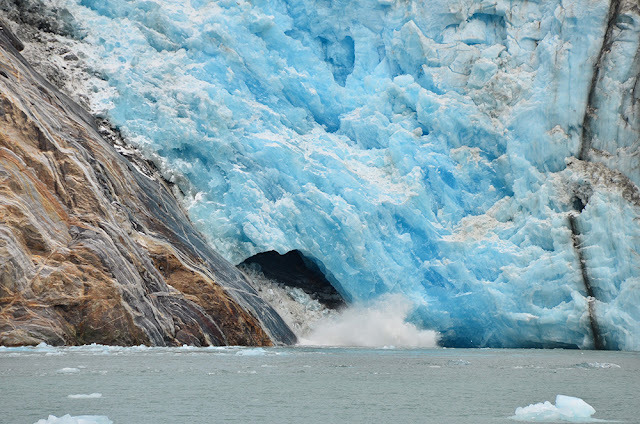 Tracy Arm still had lots of ice in it—too much to attempt to reach Sawyer Glacier. So we headed up Endicott Arm to Dawes Glacier, then into Ford's Terror. Slack at Ford's Terror wasn't until about 7:30 in the evening, so we had plenty of time to enjoy Dawes Glacier. Yesterday's rain gave way to gray skies and low clouds this morning. As we headed up Endicott Arm, the clouds lifted and we got a few sun breaks. 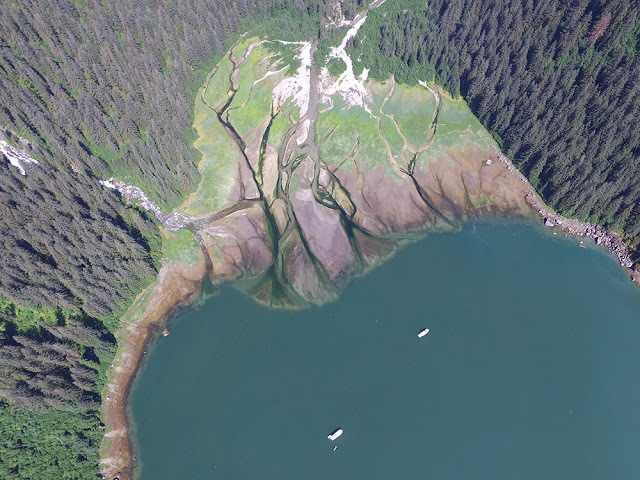 There was way less traffic in Endicott Arm than there had been a few weeks ago. 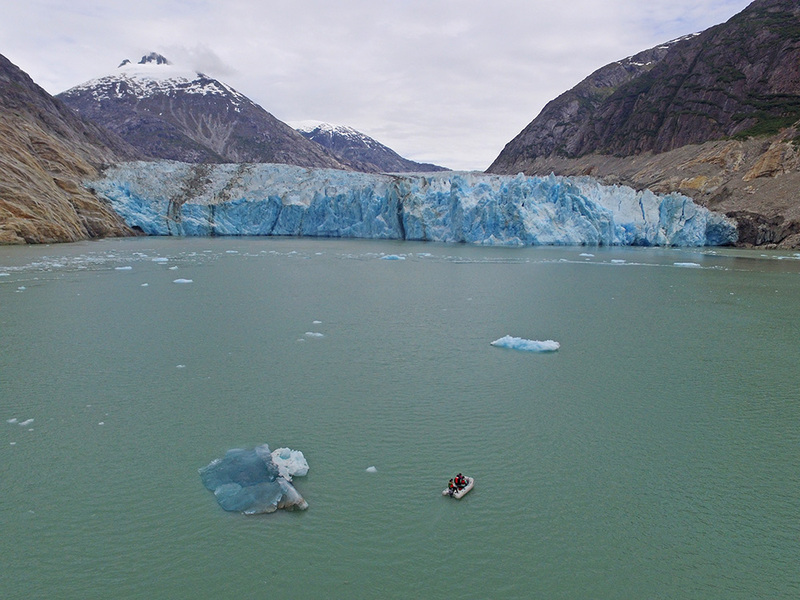 We passed a couple boats coming out, but had the whole place to ourselves when we were at the glacier. And we could get close...1/4 nautical mile. As close as I wanted to get. A nice living room view! We saw a ton of calving. Big chunks were sliding off the north side of the glacier, right where it meets the rock. Calving from the ice cave. Glad to be 1/4 mile away! I stayed on the boat and everyone else explored the glacier by dinghy. I took the opportunity to fly the drone. This was flight #99 for me, and I broke the 11 hour flying mark. When I bought the drone, I was sure it would end up crashed into the ocean quickly. Thankfully, I still have it, and I'm still having fun! 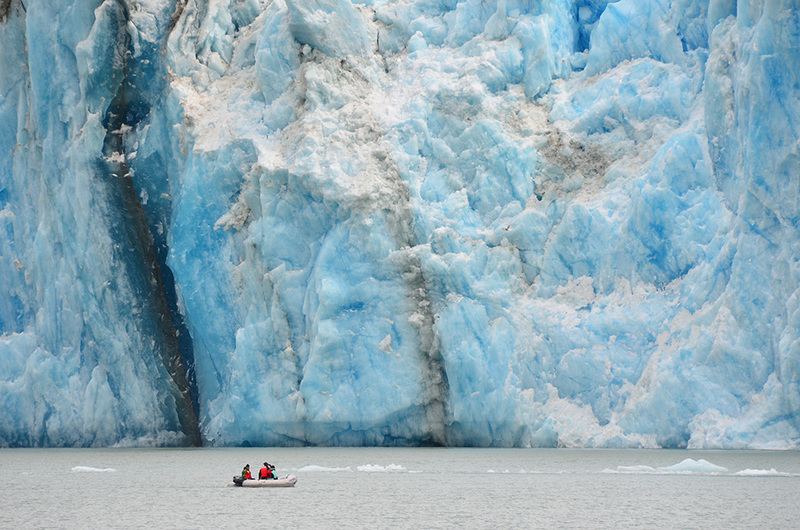 Don't worry, the dinghy was much further from the glacier than it appears in this picture. We spent a few hours in front of Dawes, then slowly made our way back to Ford's Terror. We arrived an hour early and scoped it out in the dinghy. The flood was still running about 5 knots, so we played in the rapids and waited around. About 15 minutes after high water in Juneau we headed through with a couple knots of current behind us. No problems. Friends (Laura and Kevin) on Airship were the only other boat in Ford's Terror. I dropped 220 feet of chain in 130 feet of water and expected to drag into shallower water before the anchor set. Nope, the Rocna dug right in and wouldn't come loose...pretty impressive for less than 2:1 scope (normal up here is 3:1). We're sticking around Ford's Terror tomorrow. My dad, stepmom, and their two kids arrived late last night. We spent the morning grocery shopping for the next four days, then got underway around 10:30. After sitting in Juneau for five days, it was great to be underway again. Of course, as soon as guests arrive the sun disappears. Today was among the worst days of weather so far this summer: pouring rain and 20 knots of wind. 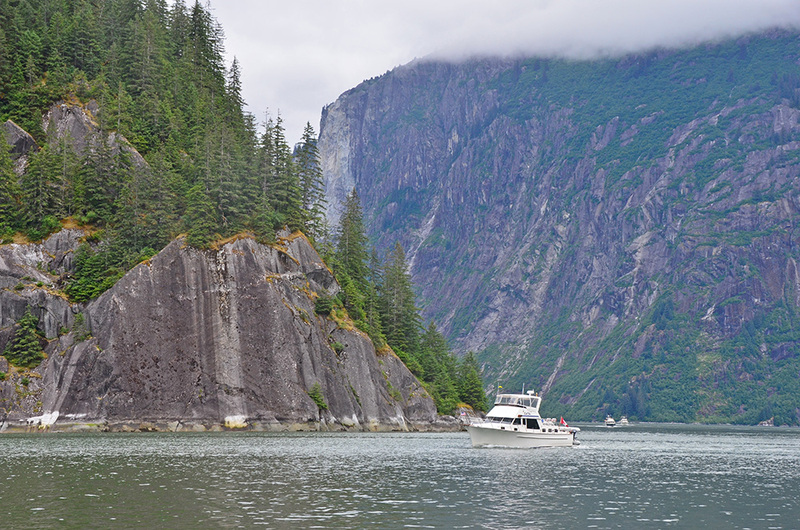 We had a wet, bumpy ride down to Tracy Arm Cove. How long will the rain last? 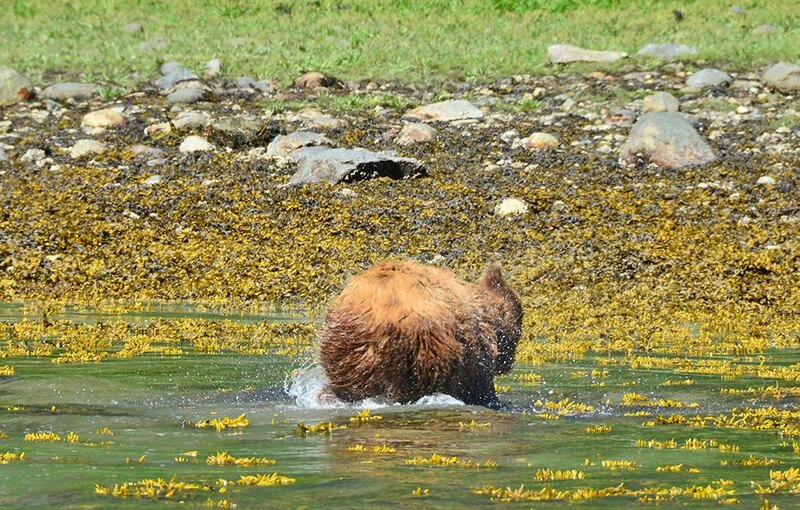 After dinner, I spotted a brown bear ashore. 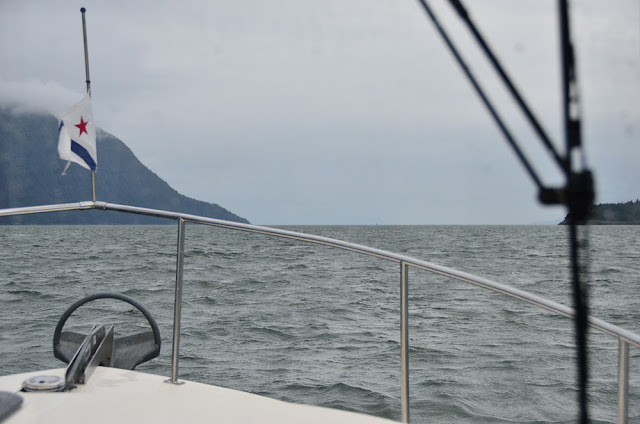 Despite the rain, we piled in the dinghy and headed towards shore. 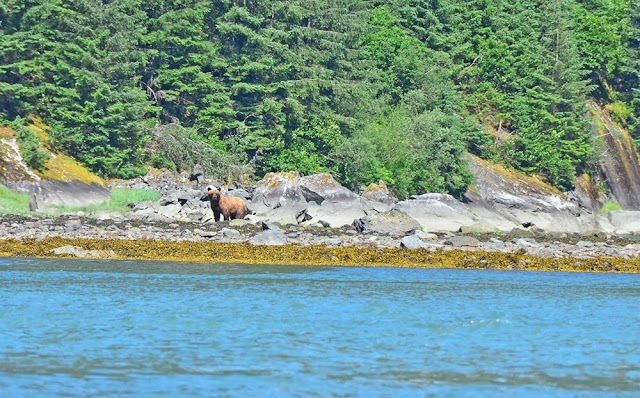 This bear was much more skittish than the bears I'd seen here last time. 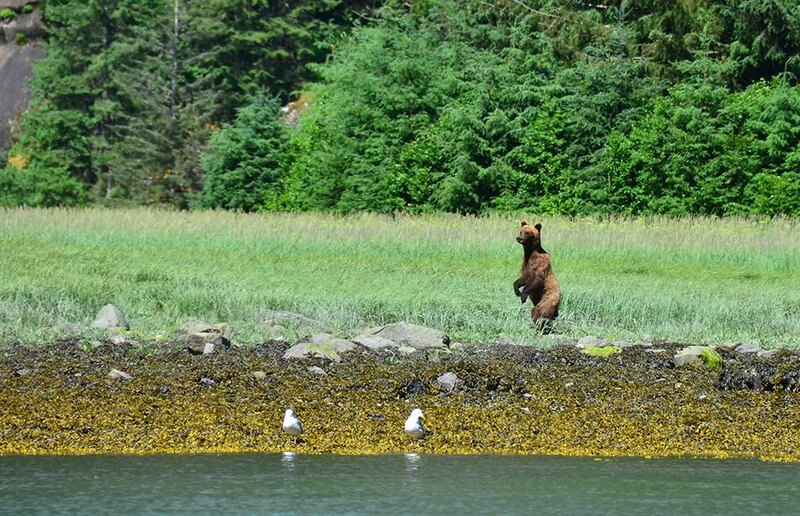 As we got closer, the bear stood up on its back legs, stared at us, and ran into the woods. Sorry, no pictures, way too rainy. 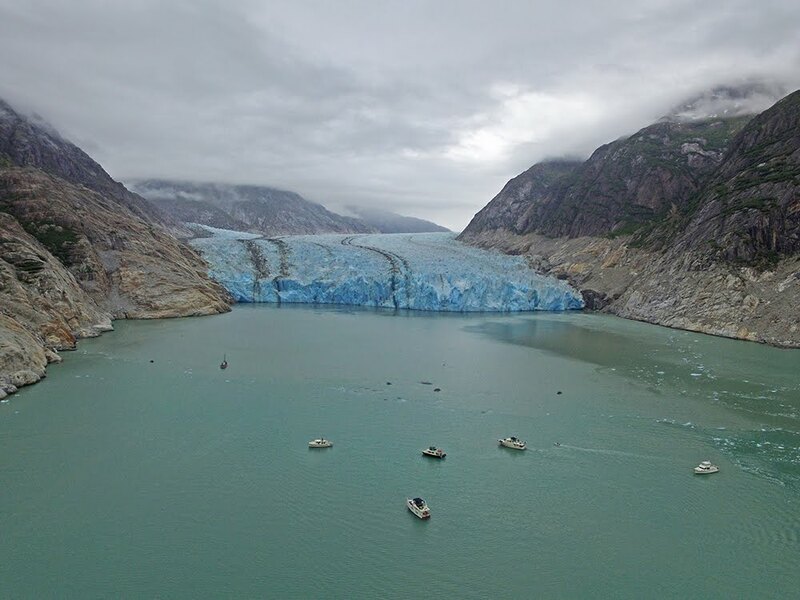 Our itinerary for this trip is Juneau to Tracy Arm Cove, Tracy Arm Cove to Ford's Terror (with a visit to Dawes Glacier), a full day in Ford's Terror, then Taku Harbor, then Juneau. Several loads of laundry...clothing, bedding, towels, etc. Of course, there was ample time for fun, too. Boating up here is a small world, and I spent time catching up with friends I've met over the years who happen to be in town. 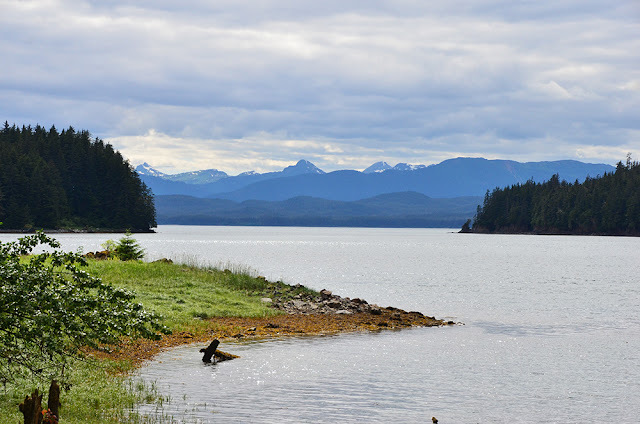 Eagle Beach, north of Juneau, for a picnic dinner. I also spent some one-on-one time with flotilla participants helping to plan their return trips. Watching the flotilla boats depart was bittersweet: sad to see new friends go, but excited for them to continue their adventure. I'm sure our paths will cross again. Yeah, the weather is really cooperating! We made the short run from Taku Harbor to Juneau. Calm water, gray skies...kinda boring, actually. 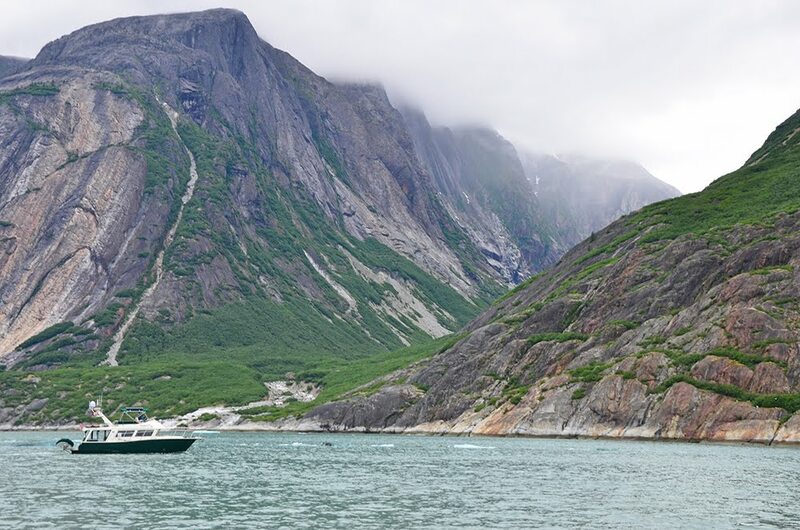 Soon after leaving Taku Harbor my phone buzzed to life: about 300 emails, a thousand Facebook messages, a bunch of voicemails and text messages. Hmm....not sure about being reconnected. 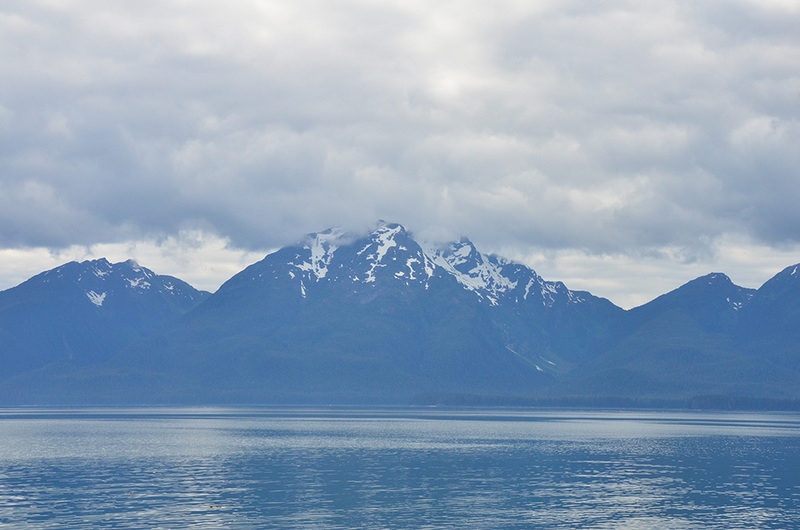 Our arrival in Juneau marked the end of the flotilla to Alaska. From here boats are scattering. 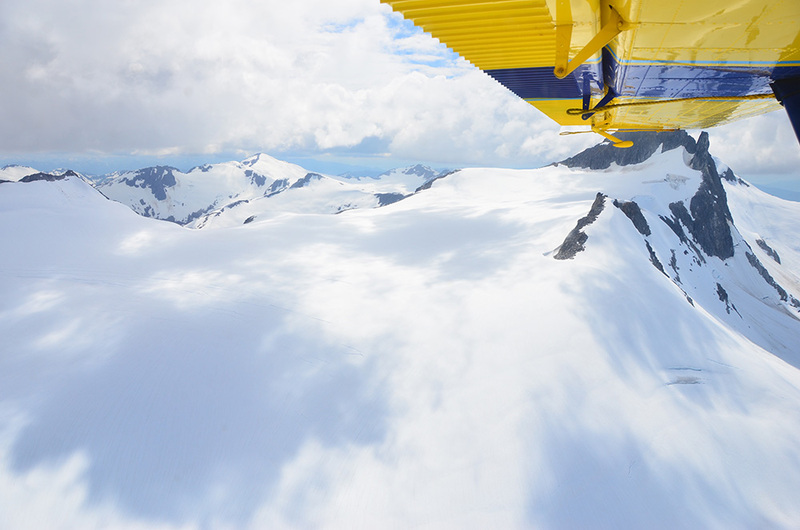 A couple are heading right home, and a couple more are spending time exploring Alaska. Having traveled together for the past five weeks and more than 1100 nautical miles, it will be a little weird traveling alone. Leading this group (and previous groups, for that matter) has been tremendously rewarding, particularly for the past two weeks. Somehow—despite the typical rainy Alaskan weather—we've enjoyed unusually warm and sunny weather. 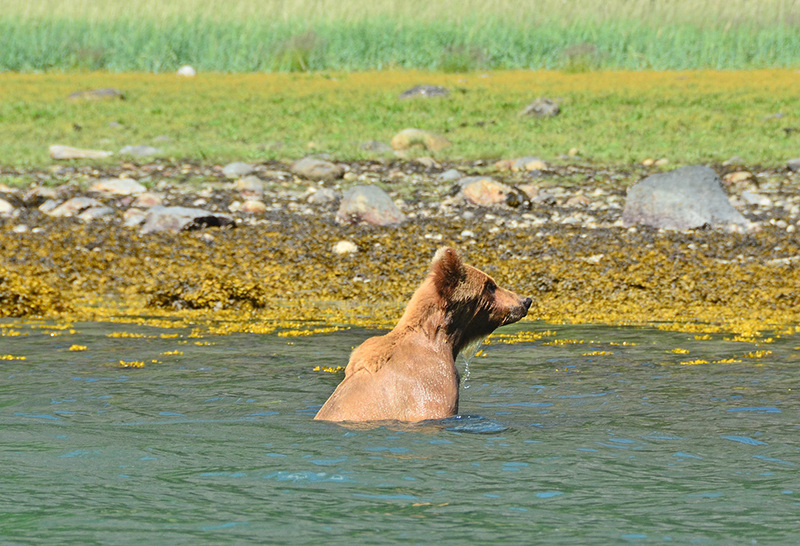 We've watched bears and whales, seals and sea lions. We've seen glaciers calve, navigated our boats through ice floes, and anchored in some of the most beautiful places imaginable. As problems arose, we worked together to solve them, cobbling together the parts and skills needed. 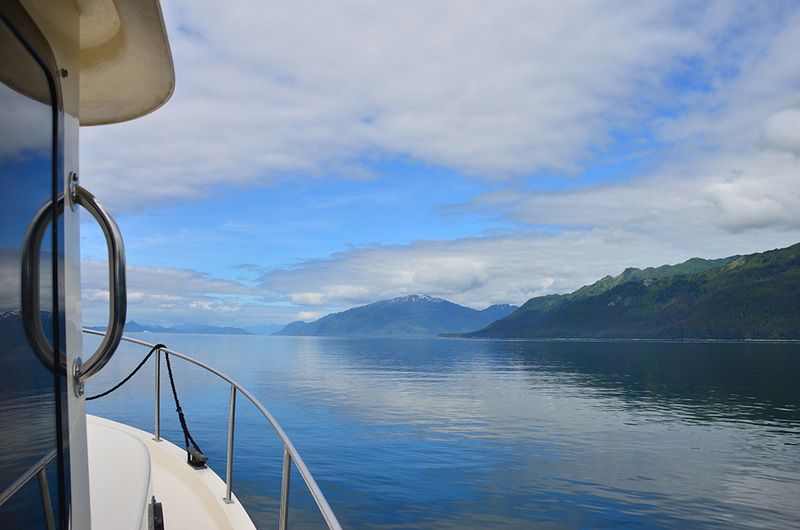 When we started the trip, most of the participants were anchoring novices. When we pulled into Juneau, several (jokingly) complained that tying up to a dock is too much work! 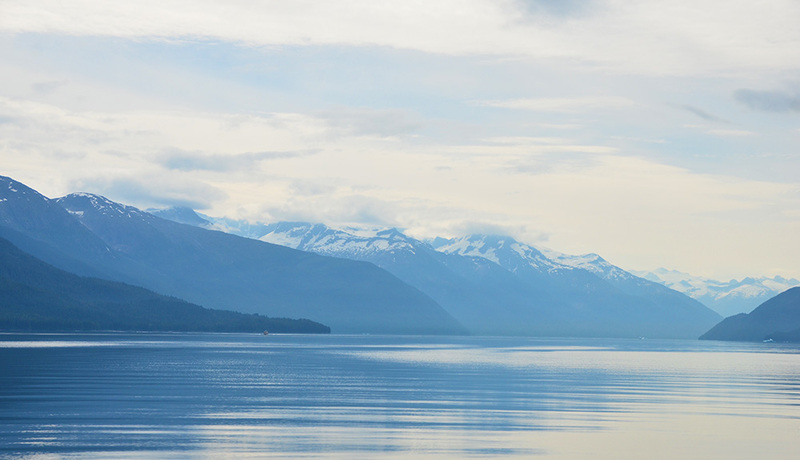 If you're interested in participating in a flotilla to Alaska next summer, shoot me an email. Time for some rest and a bit of maintenance. I'll be in Juneau for the next several days waiting for guests to arrive. As much as I wanted to show everyone Tracy Arm, I chickened out. Realistically, we wouldn't make it far enough in to see North Sawyer Glacier or South Sawyer Glacier. The ice was just too thick. We've had a great trip so far—no show-stopping mechanical problems—and I just didn't feel like pushing my luck by venturing into thick ice. 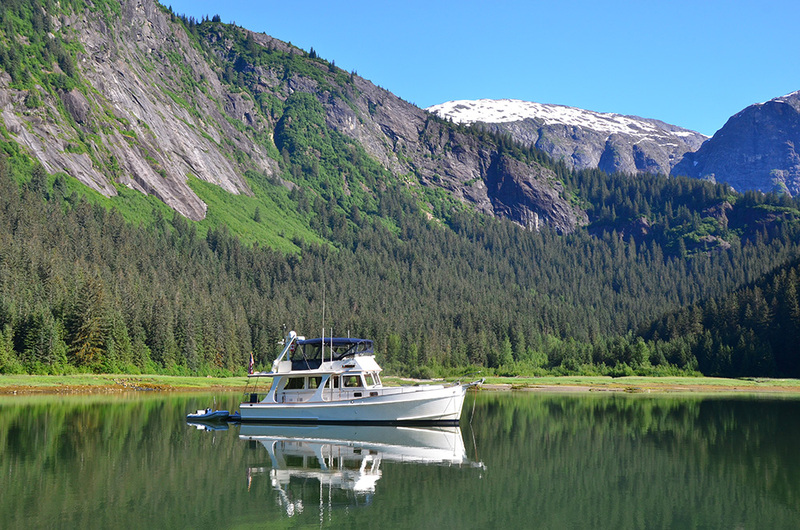 We had a lazy morning in Tracy Arm Cove. The sun was shining and everyone came over to Safe Harbour for a waffle breakfast. Lots of fun. 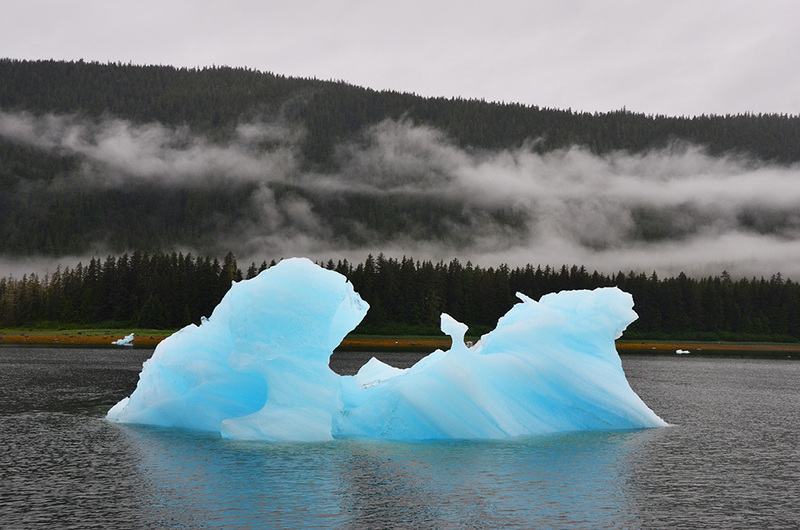 Around 11:00 a.m., we headed to Taku Harbor, about halfway between Tracy Arm Cove and Juneau. Taku has a good public dock that we could all tie up to. After seven consecutive nights at anchor, it's nice to have easy access to shore. 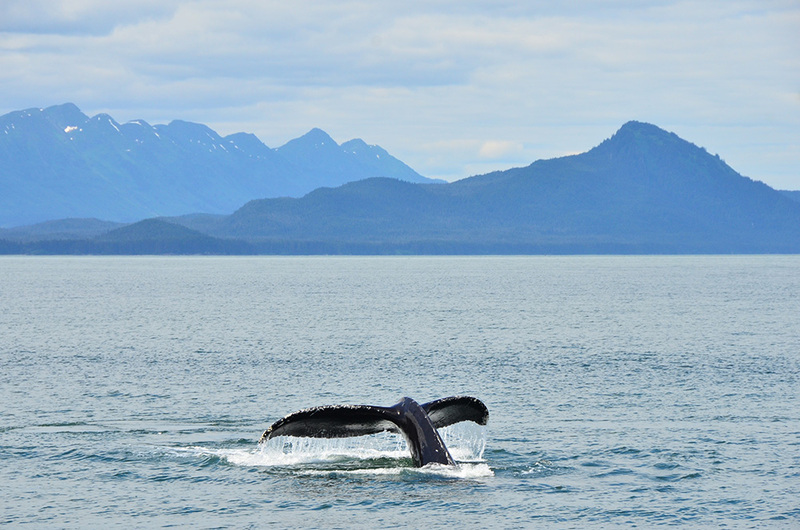 We spotted several whales along the way, including this one. It surfaced 150 yards in front of the boat and was traveling on a course perpendicular to and away from my boat. I quickly pulled the throttle to neutral and it turned around and headed right for us. 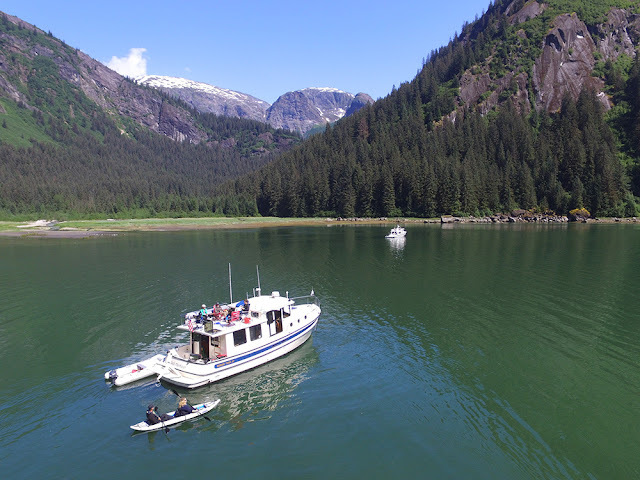 When we arrived at Taku there were already five boats on the dock, but there was enough room for all of us. Some of us explored on shore—the old cannery and the rope swing—and then hung out on the dock. A little later we did a potluck dinner on the dock, which was excellent other than the massive number of no-see-ums and black flies. 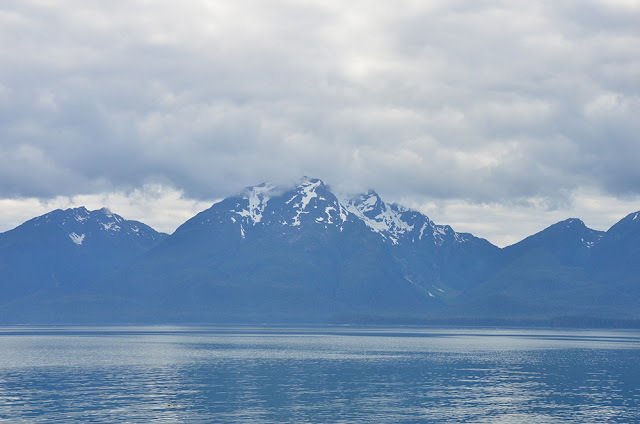 Tomorrow we're heading for Juneau and the end of this part of the trip. Clouds moved in overnight and we woke to see Ford's Terror in a different light—misty, cloudy, but no less beautiful. 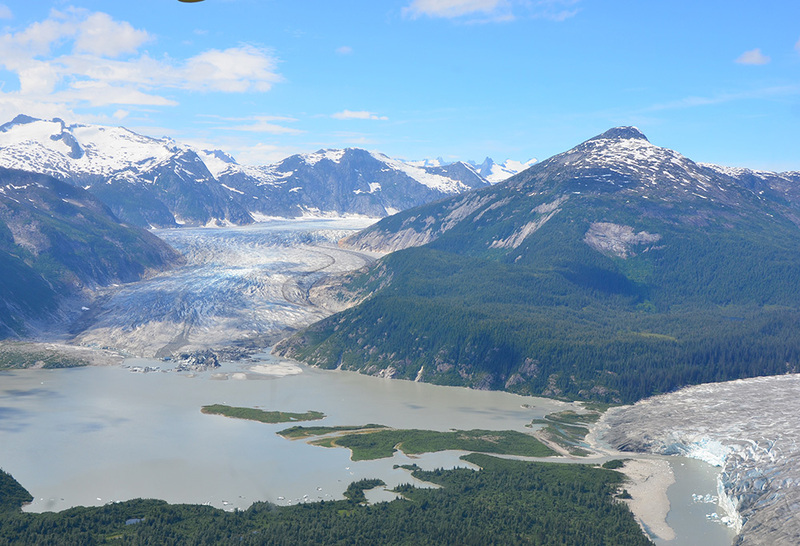 Today is another glacier day, this time Dawes Glacier, at the head of Endicott Arm. 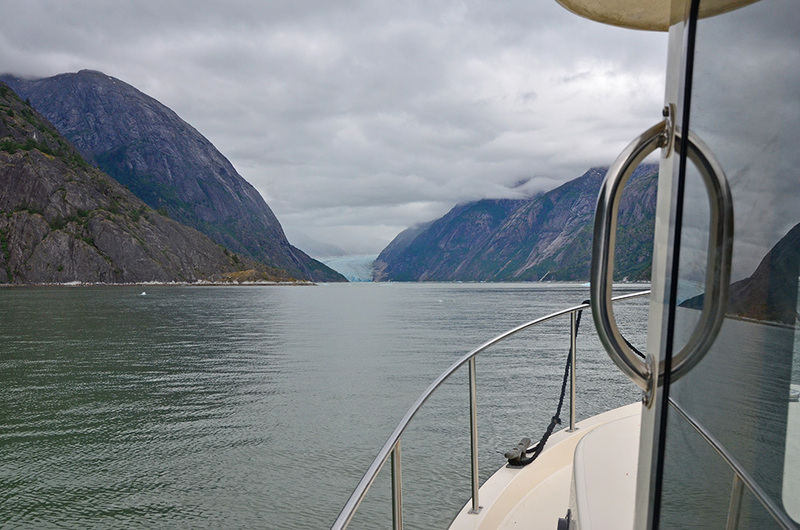 Once we see the glacier, we'll head back to Tracy Arm Cove to spend the night. 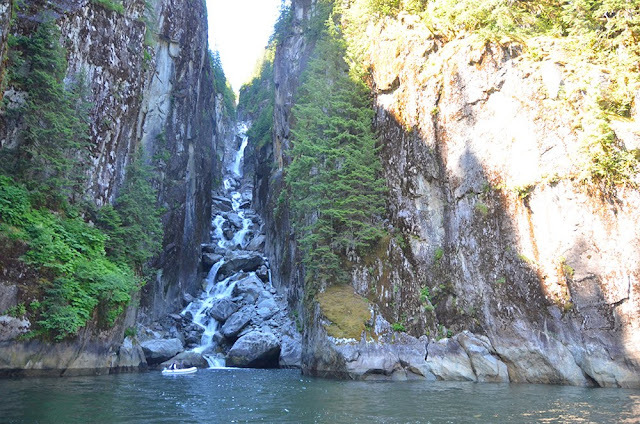 High-water slack at the Ford's Terror rapids is sometime between 12:30 pm and 1:30 p.m. Then it's about 16 nautical miles to Dawes Glacier, then 35 nautical miles back out to Tracy Arm Cove. We arrived at the Ford's Terror entrance (in this case exit) rapids at about noon, well before slack. Given the long day we had ahead, and the recon I'd done in the dinghy over the last few days, I cheated slack. The water was still flooding in, so we were traveling against it. And we made it through just fine. The maximum current velocity was about 5 knots, but the water flowed smoothly and the boats tracked well. I wouldn't want to be traveling the same direction as the current, though. Not much ice in the water. Dawes Glacier in sight. 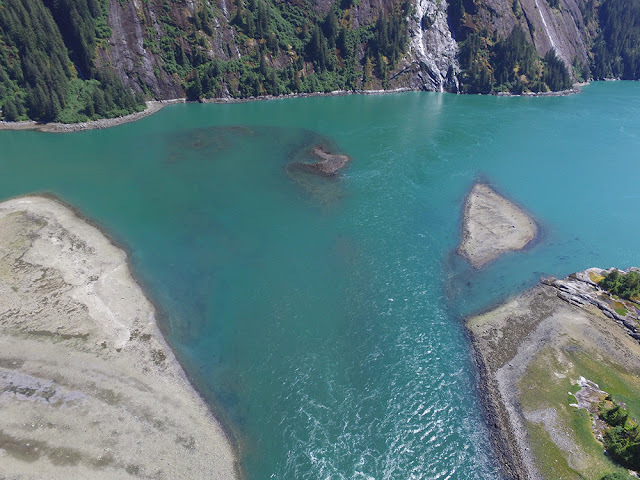 The run up Endicott Arm to Dawes Glacier was easy, with no significant ice in the water. 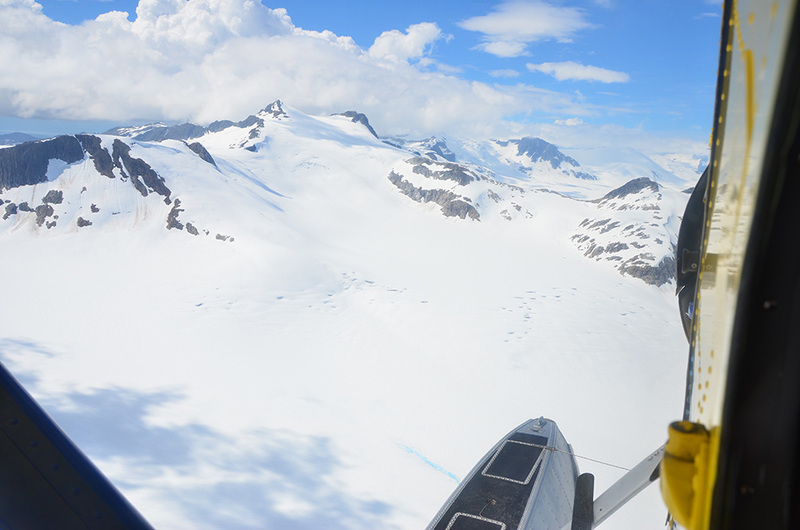 We ran at cruise speed pretty much the whole way, only occasionally having to disengage the autopilot to steer through areas with higher concentrations of ice. 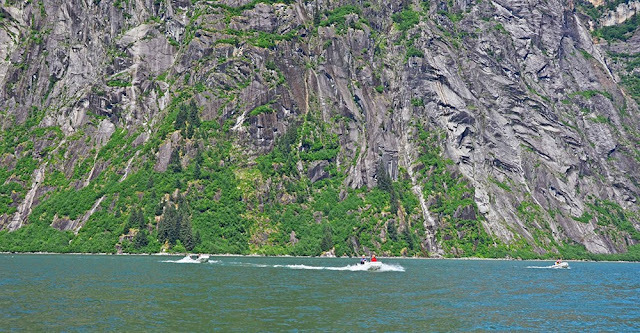 Because Tracy Arm is not navigable right now, Endicott Arm was busy. 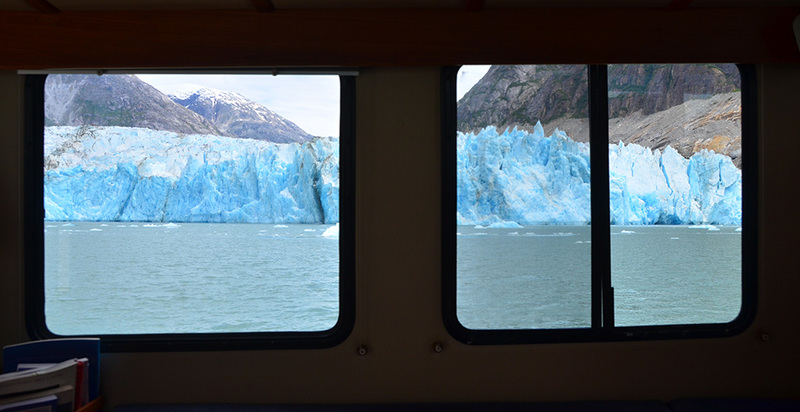 We shared the glacier-watching experience with several commercial tour boats. 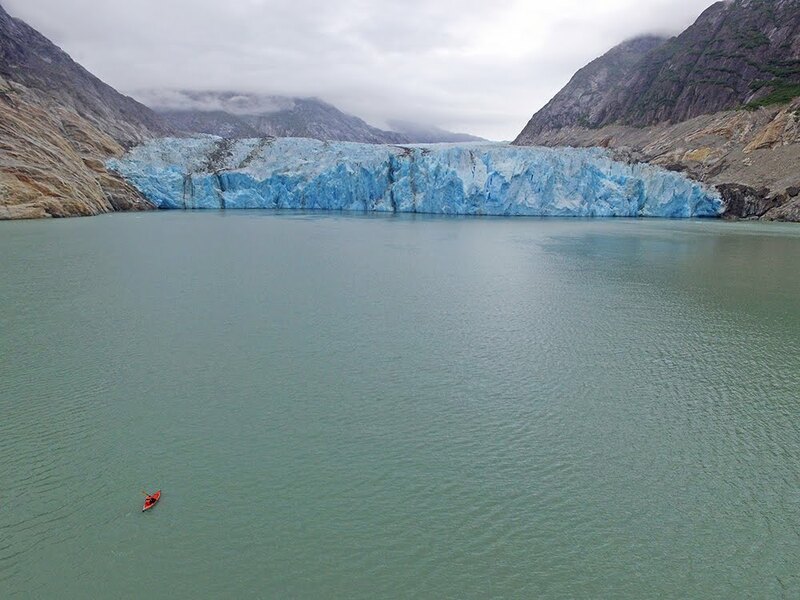 Compared to Le Conte, our visit to Dawes Glacier was more crowded with worse weather and much less ice in the water, but we got much closer to the glacier. Both were great, just different. 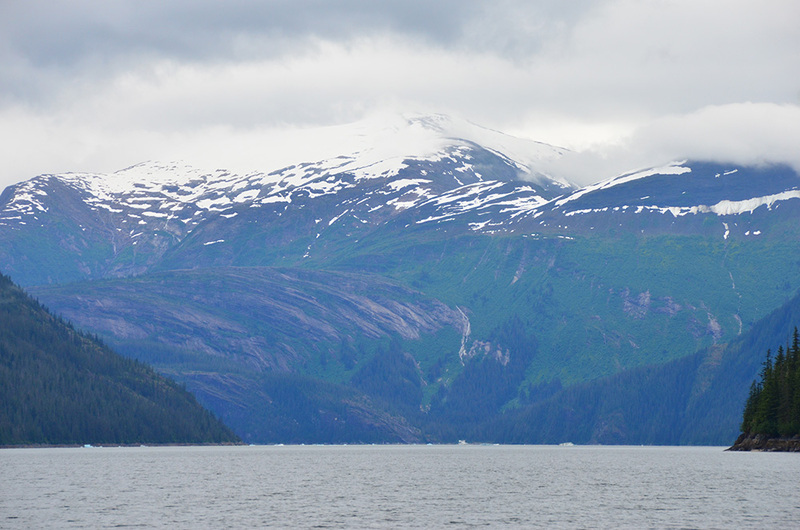 Stormy at the head of Endicott Arm. Engines off, drifting at the head of Endicott Arm. The views are impressive in every direction. 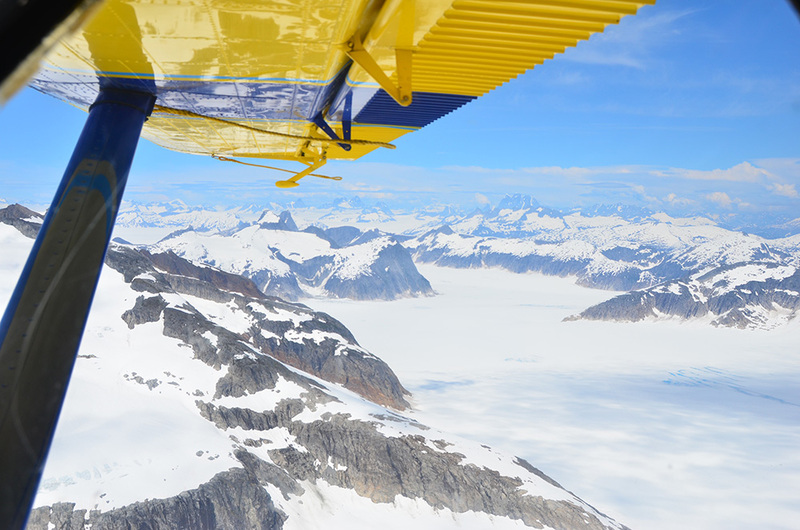 We spent an hour at Dawes Glacier, then headed out. 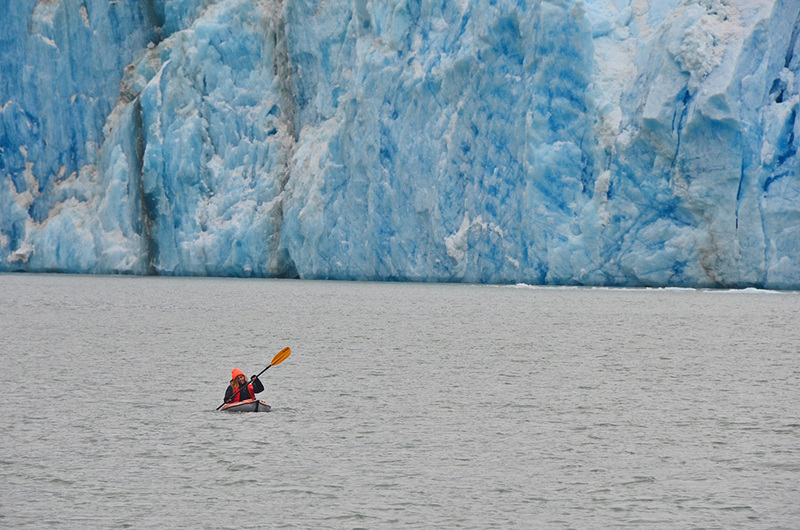 Back in Tracy Arm Cove by 7:30 p.m., tired, but exhilarated by another great day in Alaska. 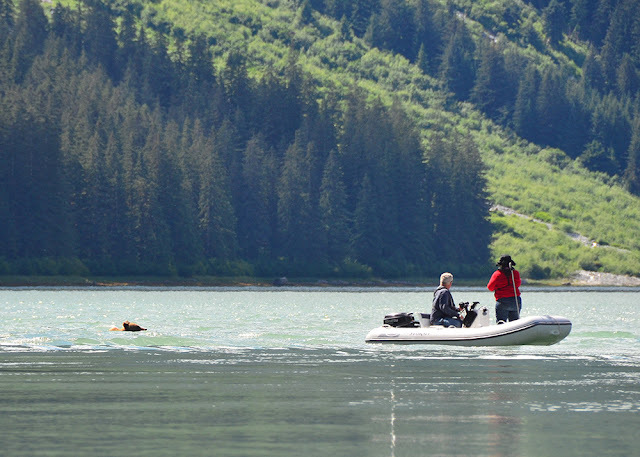 Spoiler: We saw a bear swim. From our dinghies. Another sunny day! 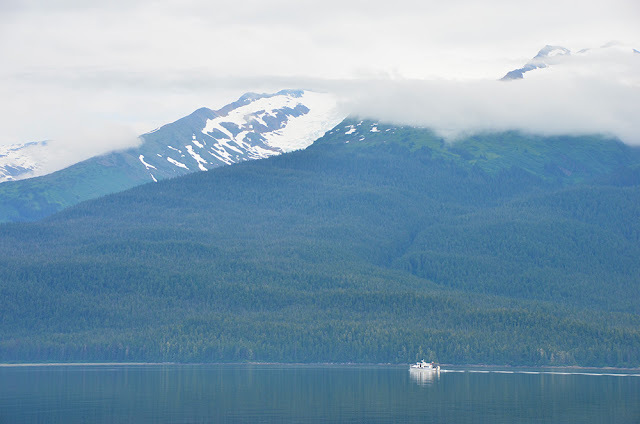 When I talk with people about cruising in Southeast Alaska, the weather is always a big concern. 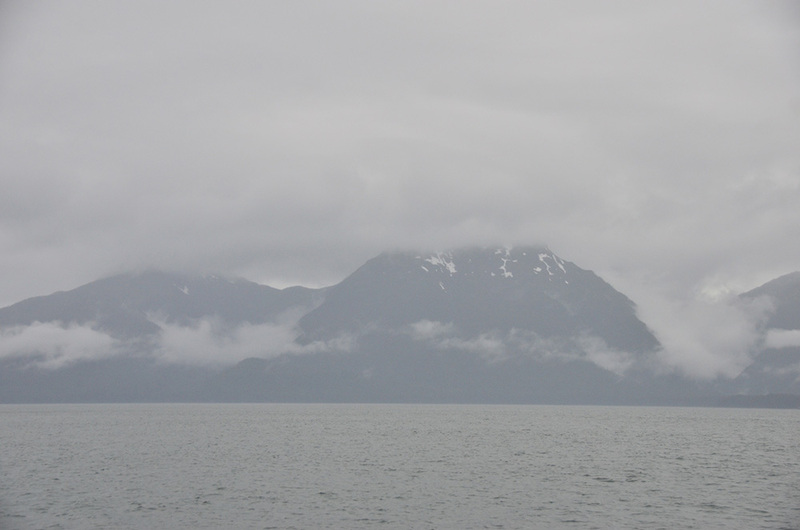 This is a rainy place—Ketchikan gets more rain in its driest month than Seattle gets in its wettest month. So far, though, we've only had a couple rainy days. Stormy at anchor. What a place, what a day! Given the magnificent weather, we all piled in our dinghies for a tour of Ford's Terror. We saw the waterfalls and played in the rapids. This waterfall looks tiny from a distance. Up close, it's giant. The highlight of the dinghy tour were two brown bears. Dinghies must be scary! He ran away after standing up and looking at us. The other brown bear was even better. 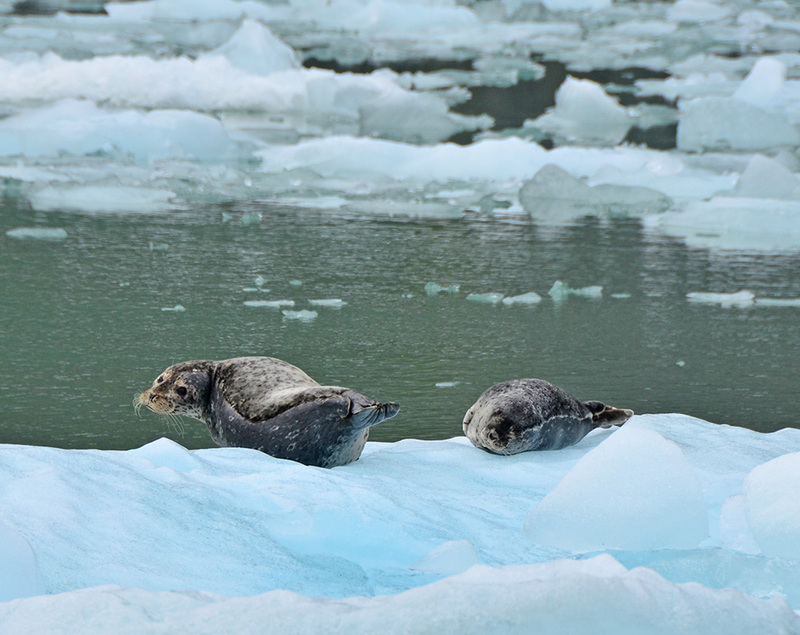 We watched as it shimmied down to the water, the began swimming through our group of dinghies. "Honey, are we a little close?" Yep, Ford's Terror is my favorite anchorage. 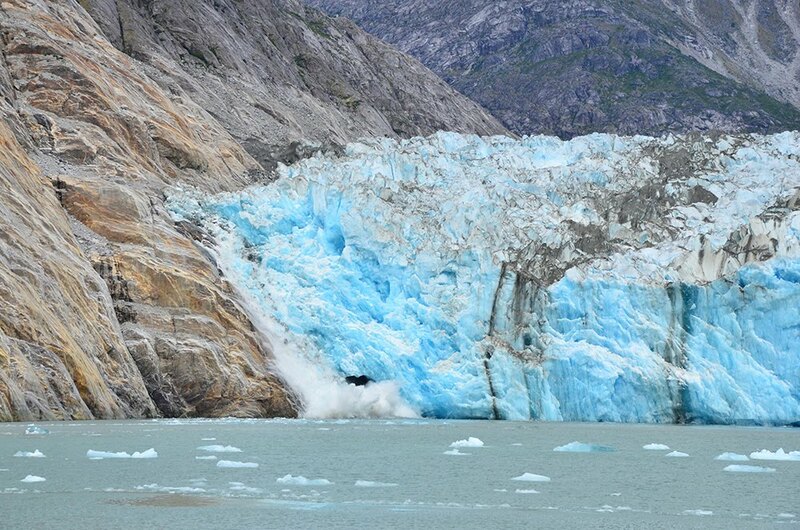 Tomorrow we'll head for Dawes Glacier, then Tracy Arm Cove for the night.